All the elegance and sophistication of white, contrasting with the tactile effect of concrete for a modern, welcoming environment that is perfect in every detail. Boost White is a versatile solution that adapts elegantly to any space. Boost White is available in the matte finish with thicknesses of 6 mm and 12 mm. 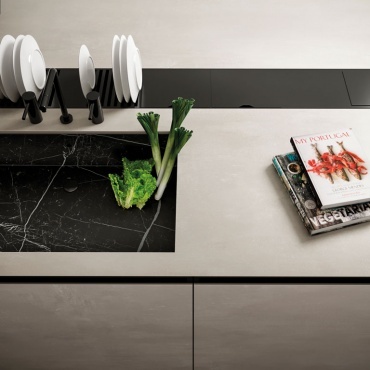 The slab's white colour with a concrete effect makes it ideal for furnishing indoor and outdoor spaces: tables, kitchen worktops, backsplashes, cabinet doors, drawers, side panels, bathroom vanity counters, washbasins, ventilated façades and bar counters. For this kitchen composition, Boost White matt is paired with Nero Marquina products by Atlas Plan and Boost White by Atlas Concorde. A mood comprised of intense, bold and elegant colour contrasts, endowing spaces with a modern, sophisticated personality.